Available daily by the slice, half or whole cake. organic or local flour, and without ingredients that contain palm oil. the health of our planet and all who inhabit it. Order online or drop by to see us and pick up something for that last minute get together! Our BEST seller every single day of the year! Fresh strawberries tucked in between layers of cream cheese cake with our made-in-house vanilla buttercream. Local berries when in season, but always NC cake flour and local, free-range eggs! Our cream cheese layer cake made from NC cake flour from Sanford Milling Company, filled with custard, fresh bananas, and organic graham crumbles that are free of palm oil! We make a cooked key lime custard from Nellie & Joe’s key lime juice to fill this tender cake that is lovingly baked with NC cake flour and local free-range eggs. Made with grated organic flour and carrots, pineapple, walnuts & spice. Lightly coated in toasted crushed walnuts. 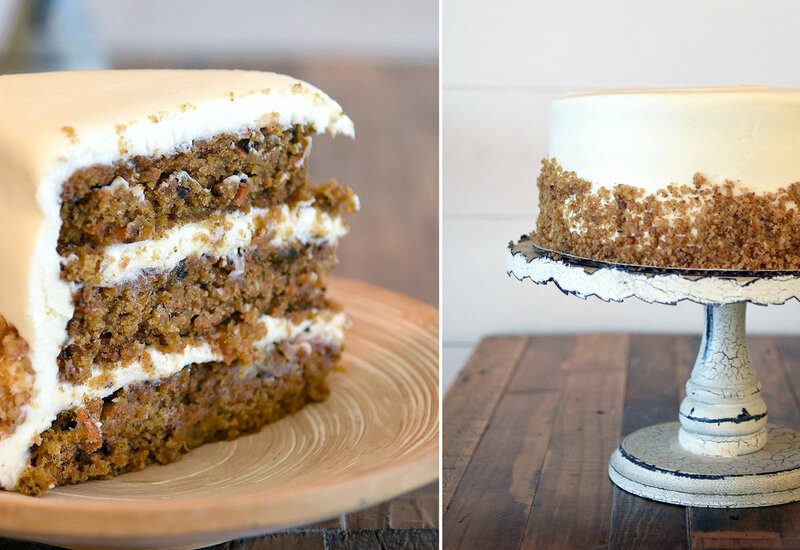 Our favorite carrot cake – ever! Coconut milk is baked into these cake layers and then they are filled with a sour cream coconut mixture that when served slightly chilled is hard to beat! Featuring organic flour. We just gave this cake a fresh update for spring! It’s the prettiest cake on the bar! Rich cream cheese layer cake slathered with raspberry cream cheese icing between the layers that is made with Greensboro’s own Jammin’ George freshly-made raspberry jam. Iced on the outside with our classic cream cheese icing and trimmed with a delicate raspberry cream cheese border and white chocolate curls. Made with freshly diced organic apples and flour ~ iced with cinnamon cream cheese icing. Pure orange and vanilla extracts flavor our cream cheese cake layers in this refreshing summer cake that features Ward's free range eggs and NC cake flour from Sanford Milling Co. We ice it with cream cheese frosting and top it off with a sprinkling of white chocolate curls. Tropical pineapple tucked in between cream cheese layer cake and finished with a coating of our vanilla buttercream! Cream cheese layer cake stacked with freshly-made organic lemon filling and frosted with our cream cheese icing. Made with freshly diced organic apples and flour ~ iced with caramel cream cheese icing. Made with organic flour and laden with bananas, pineapple, and North Carolina pecans. Frosted with cream cheese frosting & more toasted pecans. It is thought to have originated in Jamaica in the 1960’s (also known there as the Doctor Bird cake after their national bird) as it contains more fruit than flour and is oil based rather than butter. The Jamaican board of tourism included it in a marketing package for the US in an effort to lure Americans to visit Jamaica! It made its first appearance in the South right here in Greensboro by Mrs. LH Wiggis who submitted her version of the recipe to Southern Living Magazine in 1978. It was named their favorite recipe in 1990 and has been their most requested recipe ever! Fresh lemon cake layers with almond buttercream icing. Features extracts of organic lemons and almonds and NC cake flour! Uplifting key lime and organic lemon juice flavor this cake and the cream cheese frosting. Our 7 Up Cake has a loyal following! Our customers so often ask for this cake because it was a beloved recipe of an important family member in their life. It evokes happy memories of days past. Our version features our original coconut cake with crushed pineapple tucked between the layers along with the coconut filling! Made with organic flour. Oh what a cheery cake! 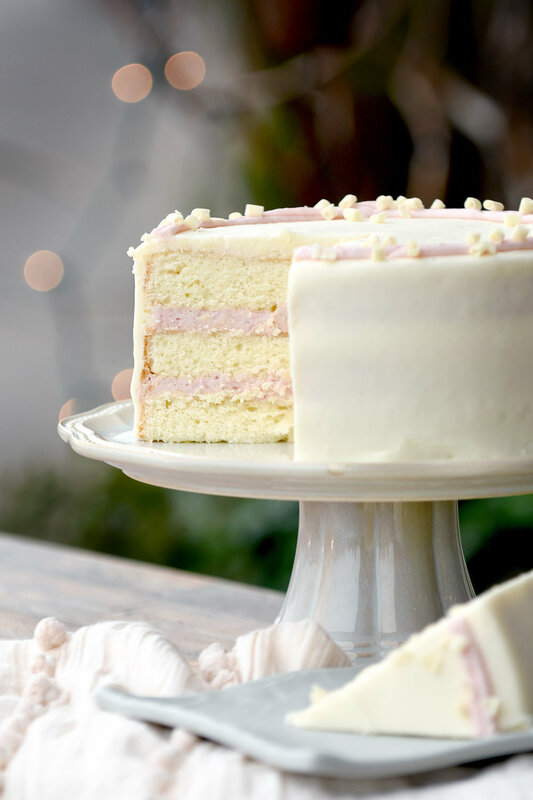 Pretty pink layers with a light, lemon buttercream and sparkling sugar crystals! A lighter version of this much-loved cake! We ice it with fresh whipped cream instead of icing for a refreshing treat! Coconut cake layers, sour cream coconut filling, and then freshly whipped cream on the outside. All the flavors of our traditional coconut cake, just lighter!